If fleeing refugees are an indicator one could conclude that there is a global surge in war, conflict, and persecution that has caused a record number of people to flee their homes in search of safety. Well, the United Nations refugee agency reports that there is a record high 60 million displaced people amid expanding global conflicts. If you have been wondering what is exactly causing this exodus, refugees putting their lives and the lives of their children at risk, our next guest Patrick Cockburn is trying to put this in context in a series published in the Independent. Patrick Cockburn is a correspondent for the Independent and was awarded Foreign Reporter of the Year at the 2015 Press Awards. He’s the author of many books, among them The Rise of the Islamic State: ISIS and the New Sunni Revolution. Patrick, thank you for joining us this evening. PERIES: So Patrick, let’s put this in context. Now, you wrote that we are in an era of violence in the Middle East and North Africa, with nine civil wars going on in Islamic countries between Pakistan and Nigeria. Elaborate on this, and what is causing this exodus. COCKBURN: Well, we’re in an era of extreme violence. These aren’t just wars, they’re civil wars. And they’re particularly bloody and cruel civil wars, stretching from Afghanistan, Iraq, Syria, Yemen, Libya, Somalia, South Sudan, Northeast Nigeria. And some of these started some time ago, in 1991 in Somalia, but most of them are fairly recent, and it’s getting worse. I mean, fighting is now spreading in Southeast Turkey. There were 16 Turkish soldiers killed at the weekend by Kurdish guerrillas. But the heart of it is the war in Iraq and Syria. From Syria we already have 4 million refugees. In Iraq, even just in the last year, we’ve had 2.6 million refugees. So it’s the tremendous, horrific conflict going on in these two countries, essentially fueled by the caliphate, so-called Islamic State, fighting the Iraqi government, fighting the Syrian government. Other jihadis also there that is leading to people fleeing these countries. And people, certainly in Europe, they were conscious these wars were going on. But they’ve really only struck home I think when these people started reaching the shores of Europe, reaching Hungary, trying to get to Germany. And when they saw this poor little Kurdish boy, Aylan Kurdi, lying dead on a beach in Turkey. So it’s quite recent that people have realized the full calamity of what’s happened. PERIES: The war is at their shores. But Patrick, this has been going on for a long time. I mean, the war in Iraq and Syria is not new. What is causing this specific exodus at this time, escalated in these numbers? COCKBURN: The exodus from Syria has been going on quite some time, since 2011, 2012. but remember, a lot of these people thought they were going home. They thought this war would be over, they went into Turkey, they went to Lebanon, they went to Jordan. And they thought maybe a year, maybe at worst two years and we’ll be going home. A number of things have happened. The war hasn’t ended. That’s true of all these nine wars, actually. They don’t seem to be ending. This war in particular hasn’t ended. So you have people who are living in Turkey, they didn’t have jobs. Their house may have been in ruins back in Syria. So now, you know, they’re despairing and they think, well, we’re going to be permanently in exile. So that’s why they’re heading off to Germany, that says it’ll give them sanctuary, and anywhere else they can go. PERIES: All right, Patrick. Let’s come back in part two and examine this a little further. Thank you for joining us. PERIES: Welcome back to the Real News Network. I’m speaking with Patrick Cockburn. He’s a correspondent for the Independent, and was awarded Foreign Reporter of the Year at the 2015 Press Awards. He’s the author of The Rise of the Islamic State: ISIS and the New Sunni Revolution. Patrick, thank you for coming back on. PERIES: In the first segment you said that the refugees are now realizing that this is not temporary. This is somewhat permanent, and they are obviously looking to settle in another country. Explain what the routing is, and what is enabling them to now leave their home. COCKBURN: Well, you have two routes across the Mediterranean. One’s from Libya, because the Libyan state, the Libyan government has collapsed. These people mostly aren’t Libyans. They’re coming from further south, from West Africa. Often they’re people who used to have jobs in building sites or in restaurants in Libya. Used to see them there when I was there. Now thought, they don’t get those jobs. So they head for the nearest point in Europe where they could find jobs and a livelihood. And Libya’s shore is about 1,100 miles long, not too difficult to leave. But many of them never make it because they’re going in boats that capsize, and things that aren’t much bigger than small rafts. But that’s about fairly steady, the number coming there, about 112,000 so far this year. The other one is from Turkey. From Turkey’s Western coast. Trying to get to Greek islands just off the coast, which are of course part of the European Union. And these are people who had good livelihoods in Syria, often left Syria quite some time ago, maybe living two or three years in Turkey. Not because they particularly like it, I mentioned, because they want to go home. They’re finally despaired and they’re trying to get to Greece, and then go on to Germany. Very few want to stay in Greece because financial crisis there, or Hungary, when they get to it, or any of the East European states. They want to go to Germany, some want to go to Britain. Others to France and elsewhere. PERIES: Patrick, explain the change that has occurred in terms of what’s happening in the ground, both in Syria and Iraq. Now, these refugees have been internally displaced, essentially, and some of them of course fled to Turkey, as you said. But what else is causing this wave of the exodus that you can pinpoint? You’ve been in the region. COCKBURN: Well, a number of reasons. Since 2011 half the Syrian population, about 23 million people, have become refugees or they’ve been displaced internally. They’ve had to move. About more than half of Syria is now controlled by ISIS, by the Islamic State. If you’re an [inaud.] if you’re a Christian–actually, if you’re a Sunni Arab also, you may be terrified of these people and have fled within Syria. And now you might be thinking of moving elsewhere. The threat of violence, if you’re in [opposition] area, it should also be said that President Assad’s air force is dropping barrels full of explosives, the famous barrel bombing on these areas indiscriminately. So lots of civilians killed. And so there’s an immensely high level of violence. And it’s getting worse, because the Islamic State is advancing westwards. As people will know, they captured the famous ruins of Palmyra, one of the great cities of the ancient world, were beheading people in the theater there, blowing up ancient temples. They’re very close to cutting Syria in two. They’re very close to the main north-south road there, and they’re advancing West. And nobody much is stopping them. The Syrian army is fighting, but seems to be on the back [foot], retreating. I don’t think there’ll be a collapse of the government, but you can see signs of it weakening. And that of course frightens people in Damascus and elsewhere, thinking this war is not going to be won, and maybe, certainly not by the government. And maybe one day ISIS, the Islamic State, will be here in Damascus. It’ll be too late for me to get my family out, so let’s run now. So the potential–previously a lot of the people leaving were leaving pro-opposition held areas in Syria. But it’s people in government-controlled areas, which are much larger in number, who now may be trying to get out. Not easy to do to get into Lebanon or get into Turkey or elsewhere, but they will try. In Iraq, since the Islamic State captured Mosul, the Northern capital in June last year, people are going, are terrified of the Islamic State, and they’re terrified of the fighting. I mean, you don’t want to be in a town when people are exchanging artillery fire. So again, you have two and a half million displaced people inside Iraq, and a lot are coming out. About 450,000, I think so far this year. Half a million. That’s an awful lot of people. I think there are about 17 or 18 flights between Baghdad and Istanbul in Turkey, every day. Those are packed with people leaving Baghdad because they think things aren’t going to get better. So this is a massive crisis, and it’s getting bigger by the day. PERIES: Patrick, what is the class nature of the exodus? 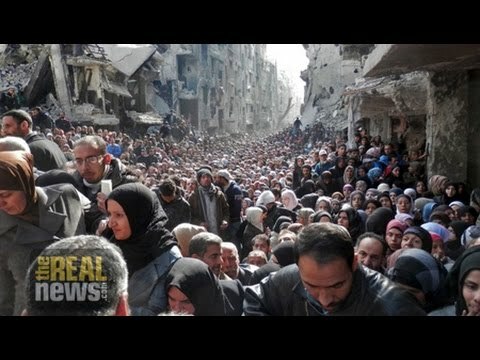 I know that initially when the war started in Syria, of course the quite wealthy fled to various parts of the world, including Canada and Europe, and the U.S. What is the class nature of the people that are remaining and struggling now? COCKBURN: People who are remaining in the country, sometimes you’re right, they are the very poor who don’t have the money to even make it to get an air ticket, or survive when they get to the other end. You have other people who want to get out. I have a former driver in Baghdad, he used to work for me. He’s a Sunni. He lost his house, it was in a Shia area. He put all his money into it and he lost it, no compensation or anything. He’s desperate to get out. He’s a 50-year-old man, the only thing he knows how to do is drive a car, a taxi. He only speaks Arabic. He tried to get out before, he went to Cambodia and Vietnam. He spent such little money had. There are people who are caught because there’s no life for them back in their own country, in Iraq or Syria, and there isn’t a life for them abroad. So I would sort of, I think it’s a real bad idea for this guy to try and get out, because where is he going to go? But maybe the alternative is getting killed. So how should–getting his family killed. So you know, that’s a terrible dilemma for him. PERIES: Right, very well. We’ll follow this crisis and hope you can join us again, Patrick Cockburn.